If a fragment of the brain or spinal cord be examined with the unassisted eye, it appears to be composed of a soft curd-like material with red points and streaks distributed irregularly through it, differing a little in colour in different parts, being here almost pure white and there pinkish gray, but everywhere so soft and apparently destitute of structure, that Haller, one of the most learned and expert physiologists of the eighteenth century, could only describe it as a uniform pulp with but few indications of structure, presenting only blood-vessels and some obscure fibrous markings. 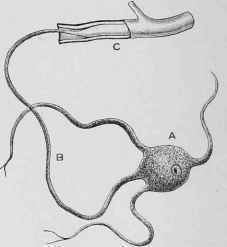 The great improvements that have been made in the construction of the microscope, and in the process of hardening, cutting, staining, and mounting specimens for microscopic examination, now enable it to be shown that whilst there is an abundant supply of blood circulating through each part, the essential elements of every nervous system are nerve-cells and nerve-fibres, both of which recpuire careful consideration. 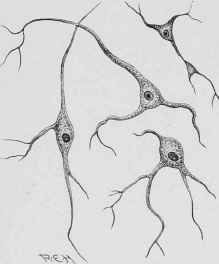 A, Nerve-Cell. B, Axis-Cylinder Process, uniting with C, a Nerve.